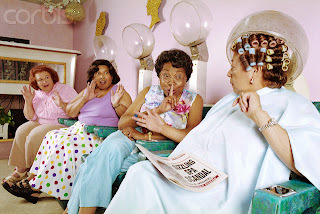 Per WomenOlogy, an Ogilvy Blog, the way to reach the African American Woman is to meet her at the beauty shop. This is a place that she frequents often. Its a place where lots of talking takes place. Multiple exposure of a single topic of discussion can provide individuals with desire to make a change. This article pushes the idea that if marketers could find their way into the beauty salon and take part in the conversations that go on, they can in turn tap into this consumer market. B.M.M.O. Consulting would have to agree. In the beauty shop you talk about EVERYTHING!!!! It is the place to go to find out what's going on down the street, in Washington and even in other countries. It is the place to find out the latest fashion trends, hair ideas, home remedies and fun work out plans. Every time I leave, I have gained some insightful information. Its a wonder it has taken all these years for marketing departments to figure out this is the place to be. Not only can they market their product, but they can walk away with information they never expected. Some marketers did realize the importance of showing up in the hair salon to get noticed, but they were only hair products. In every hair salon there is a hair magazine. They are a necessity!!! Women need to have examples of new hair styles and colors to get inspired, unless you have an awesome beautician like mine, Calanthea Thomas who always works wonders! This is why the first place the marketing should begin is in hair magazines. It's the prime location to attract the African American Woman Consumer, she's in her environment, with a magazine that meets her hair creative needs, easiest way to acquire that target market. That's my two cents, but I will be watching to see just how marketers plan to infiltrate the salons and get their products and news wrapped into all the other shop talk.